For ordering our cookbook. We know you'll just love it!!! ClickBank or CLKBANK.COM, (Not "Food For Lovers"). In order to access the book in PDF format, you will need Adobe Reader installed on your computer. It's probably already there, as Adobe is the standard, often used to view internet information. back and get your cookbook! You will need Adobe Reader (the latest version is recommended) installed on your computer in order to open and read this eBook. You can get Adobe Reader here (a new window will open so you can download without leaving this page). Got Adobe Reader installed? Great. Now Download the eBook. Right click on the link and choose "Save Target As" or "Save File As." Then select where you want to save the file on your hard drive. Once you have saved the file, locate where you saved it, and double click to open. Problems ordering or downloading this e-Book? Let us know at Tech Support. We'll make it right! P.S. : We ask only that you do not make copies, alter, sell or "share" this entire cookbook with others, as this is a copyright infringement, (and theft). 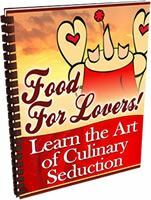 Tell them how to order their own copy, at www.findlove-keeplove.com/soulfood-recipes.html . Enjoy!